Long buried secrets are about to be uncovered below the city of Sleepy Hollow. 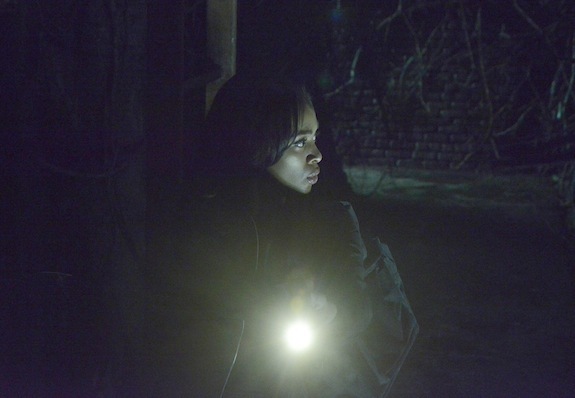 Secrets that aid Ichabod and Abbie greatly, but bring potential danger to those they swear to protect. It all begins with a simple survey, when a three man team heading into the tunnels to discover an ancient hatch. Upon opening it, the trio is pulled into the darkness below by some sort of terrifying mole-man like creature. With a patriotic field trip cut short, Abbie and Crane begin to investigate this missing person’s case with their secret knowledge of the tunnel system immediately giving them an edge. It isn’t long before they discover the hatch but are quickly surrounded by the creatures below. They regroup and study information found at the scene, but must contend with a new foil to the investigation: one of the missing men just so happens to be the brother of Calvin Riggs, an investigative journalist who is coming too close to discovering the secrets surrounding Sleepy Hollow. In an attempt to control the information Calvin receives, she invites him onto the case with limited access. With a glance at the survey info, Crane realizes the structure below has been constructed by none other than Thomas Jefferson, whose friendship to Ichabod was cut short for reasons that still remain unknown to him. Armed with more firepower and a few tricks up their sleeves, the group descends once more… This time, they successfully reach the chamber and run into none other than Jefferson’s supernatural hologram. temporarily become the man he once was and is fighting to get his family out of Sleepy Hollow before he changes forever. With Jenny’s aid, his plan comes to completion, but what remains for him in the near future seems nothing but grim. With the day saved and a potential new friendship forged with Calvin, Ichabod and Abbie stand firm in their choices, but one can only hope they are prepared for the dark days to come. Evil is stirring, with Katrina having a dream of Henry’s return and his plead for her aid in his quest. But as she awakes and rinses her hands Katrina discovers it was more than a dream and the temptation to join her son is painfully obvious. The family ties have always run deep, and soon, blood may be spilt over this divide in loyalties.